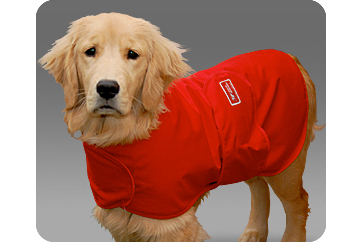 The Storm Defender cape gives relief to dogs who are excessively afraid of thunderstorms. Patented relief for your pets from thunderstorm phobia! Dogs naturally try to escape the static charge by moving toward items that are electrically grounded. Many thunderstorm-phobic dogs seek shelter in the basement, around the toilet, shower, tub or near pipes. They also may try to hide or get underneath something. Favorite spots are often the bathtub (if made of porcelain coated cast iron) or the car. When properly used, the Storm Defender cape will reduce the dog's anxiety. The cape has a special metallic lining that discharges a dog's fur and shields him from the static charge buildup reducing his sensitivity to the charge. The dog gets relief, and after a few storms begins to learn that the secondary triggers like rain, wind, thunder, barometric pressure and smells are no longer to be feared. With the cape on, the dog feels as though he has found a safe place. The Storm Defender is coming soon to Midnight Pass. In the meantime, visit their website to order.